Presented at the Third Festival of Myth and Psyche: Science and the Sacred, Colorado Springs, CO, July 25-27, 2003. Published in 2004 in Harvest: The Journal for Jungian Studies, 50, 1, pp. 7-27. An important part of the dialogue between analytical psychology and physics occurred between C.G. Jung and Wolfgang Pauli, one of the greatest scientists in the twentieth century. The recent publication of Atom and Archetype (Meier, 2001), which contains 26 years of correspondence between Jung and Pauli, reveals how profound their interaction was and how thoroughly committed Pauli was to his own individuation. Those letters demonstrate Pauli�s considerable influence on Jung�s understanding of synchronicity and a host of other critical ideas. This paper extends and clarifies their dialogue by developing one of the most important themes in their long exchange. I begin by reviewing the principle of complementarity, the most essential principle within quantum mechanics. A synchronicity experience is then employed to discuss in detail Pauli�s assertion of a complementary relationship between analytical psychology and physics. My approach to exploring the relationship between analytical psychology and physics preserves the unique nature of each discipline and yet offers an avenue for their harmony and unification�a subject taken up in forthcoming work. Pauli announced a pivotal theme when he wrote, "I regard physics and psychology as complementary types of examination" (Meier, 2001, p. 180). Although Pauli never expands on that statement, he makes it several times and is clearly using complementary as a quantum physicist would. To appreciate Pauli�s assertion, I review the meaning of that term in physics. Neils Bohr, the patriarch of quantum mechanics, was the most prominent articulator of the principle of complementarity. (Bohr, 1934, 1958) This principle, at the very heart of quantum mechanics, expresses itself in the ubiquitous acausality and nonlocality of quantum phenomena. Bohr believed that complementarity was a major new category of thought with ramifications way beyond physics (Bohr, 1934, 1958). In honour of that belief, he redesigned his coat of arms with the yin-yang symbol and the statement, "The opposites are complementary." Of course, such a deep concern with opposites and their reconciliation is at the core of analytical psychology. First, complementary properties require mutually exclusive experimental arrangements for their study. For example, you cannot simultaneously measure wave and particle properties of a photon. A given measurement must always choose to reveal some property and forgo measuring the complementary property. Members of a complementary pair typically exhibit great disparity between them. For example, a wave is spread out over a large region and has variable amplitude, while a particle is localized and discrete with fixed properties. It is difficult to conceive of more dissimilar properties than waves and particles. However, the mutually exclusive experimental arrangements required to manifest each member of a complementary pair prevents any conflict or inconsistency between the disparate properties. Contrary to some early interpretations of quantum mechanics, we now understand that complementarity is not a limitation on the sophistication of our measuring devices or techniques. Instead, it is impossible for a system simultaneously to possess both complementary properties. Complementary properties are not like the sides of a coin lying heads up on my desk. Although we cannot see its tail, we know it is there and just as fully objective as the head. In truth, complementary properties are not well-defined independent of the details of the measuring apparatus and the act of measurement that brings potential properties into actual manifestation. Second, both poles of a complementary pair are equally real and important in characterizing a system. One pole cannot be reduced to the other. For example, we need both wave and particle properties to characterize a neutron. Neutrons are neither very small waves nor spread out particles. Waves and particles are an oppositional pair of equal importance that cannot be resolved through such reduction anymore than you can reduce light to darkness or vice versa. Third, a unitary reality encompasses all complementary properties in the form of possibilities for manifestation. This unitary reality has an abstract mathematical expression in the wavefunction and the dynamical equations that govern its evolution. The unitary reality is not on the level of the complementary properties that it unifies nor does it obliterate their differences. A simple visual image can summarize complementarity. 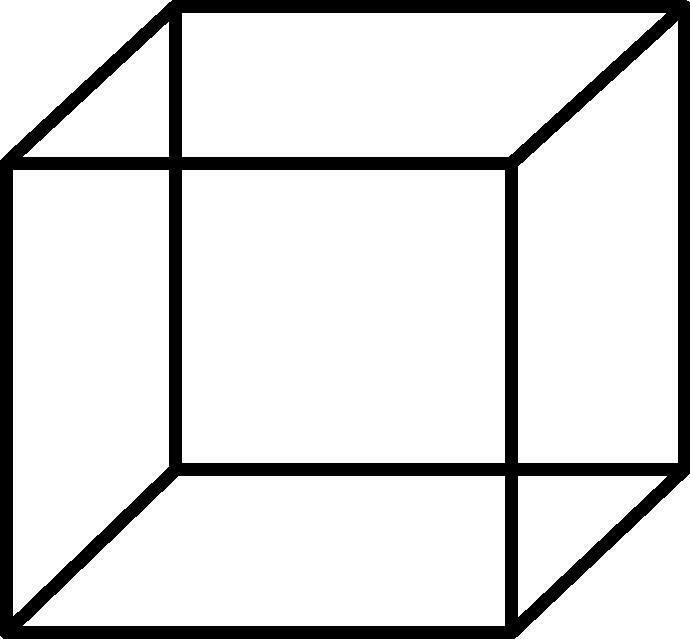 Let your eyes relax and look at the cube in figure 1. At first, one surface appears closest to you. After looking for a moment, a different surface will appear closest to you. Upon further looking, those two views alternate, but you never get two views simultaneously. Take enough time to see the effect. Here are complementary views of the cube, with the two views being mutually exclusive and thereby prohibiting conflict or inconsistency. Independent of our looking, neither view is well defined. Of course, neither view is more real nor is one view reducible to the other. To complete the analogy, consider the cube as an expression of an abstract mathematical structure, a Platonic Idea of cube, which is partially manifested in all sorts of cube like structure. The Idea of cube is not fully embodied or actually present on the same level as the lines of the drawing. Instead, the Idea holds the possibility for every potential manifestation of cube. Since complementarity is so central to this paper, here is another example�slightly lurid, but accurate. Imagine that we are constructed so that we cannot see out of two eyes at once; looking with the left eye excludes looking with the right and vice versa. Now imagine that you look with your left eye and see a person who looks exactly like Mother Teresa of Calcutta. Then you look at the same person with your right eye and see Saddam Hussein! In shock, you switch to your left eye and there is Mother Teresa again. Switch back to your right eye and there is Saddam. Here are two disparate views of the same person that require mutually exclusive conditions for their observation. Both views of the person are essential to the totality of that person and one view cannot be reduced to the other. Finally, to complete the analogy we must posit a unity of the person that integrally contains the potential for both views. With this theoretical foundation, the challenge is now to understand how complementarity characterizes the relationship between analytical psychology and physics. To provide a concrete framework for the discussion, I briefly present a dramatic personal experience�a much-condensed version of a description in my recent book (Mansfield, 2002, pp. 137-48). However, the analysis is unique to this paper. March 12, 1999: I am standing in a motel room in Phoenix, Arizona, lecturing to the walls. It feels tedious and unnatural, but this act of desperation seems to have helped polish the talk. I�ve given the lecture before but never been happy with it; I haven�t been able to hit the right level of technical detail or set the right feeling tone. Having just used these ideas about the complementary nature of soul, its immortal and mortal aspects, in writing a chapter for my new book, I am particularly eager to do them justice tonight. I have been captivated for years by this complementary view of soul as being undivided, immortal, and infinite, while simultaneously being divided, mortal, and finite at every level of soul. Giving the practice talk has put me in a lovely feeling state. I am grateful for the privilege of being able to discuss such noble ideas. However, I am running late, with a little over an hour to grab a quick bite and shower before my hosts meet me. I get some directions from the motel clerk, but it takes me much longer than expected to walk to the restaurant. Now I am really squeezed for time. I reach an intersection. The restaurant beckons from directly across the street. There are stopped cars in the nearest two lanes, but the third lane, farthest from me, is empty. Despite the flashing red hand telling me not to cross, I think I can make it to the median divider. I run out into the crosswalk in front of the two lanes of stopped cars to my left. Just into the third lane: thud! I am lying on the ground and hear a car skidding to a halt ahead of me. I drag myself up from the pavement. I am way outside the crosswalk now and cars are flying by on all sides of me. There is a deep pain in my left shoulder and I am sore all over as I stumble toward the little black sports car that just hit me. My heart is racing so fast it feels ready to burst. "I am really sorry," I tell the driver. "You scared the hell out of me! Are you all right?" he asks. "Can you call an ambulance?" I feel an extraordinary combination of extreme gratitude and pure terror. Two beautiful young women come running up to me. "Are you all right? Wow! I never saw anything like that! You just flew through the air. Can we help?" With the low sun streaming through their hair giving them halos, they look like angels. I ask them to get the book I was carrying. I point it out to them. It must be fifty feet from the site of impact. Shortly after they retrieve the book, the police arrive. While the police are taking photographs of the car, I sit on the grass beside it. The right headlight is smashed; a bit of my blood is on the hood, along with scuffmarks; and the right side of the windshield is badly smashed. An ambulance arrives. I get on a gurney and appreciate lying down and letting go for the first time. On my back, the little knot of consciousness known as Vic seems absorbed into the vast cobalt blue sky. Lifted up and out of myself there is only deep blue sky with no sense of my own personality. The experience soon ends as they put an intravenous line into my hand, put an oxygen mask on me, and test for internal injuries, nerve damage, and so on. They are so kind. I don�t want them to worry about me. I know I am OK. I want to reassure them, to put their minds at ease. I thank them repeatedly and inwardly give sincere thanks to all the higher powers. "You were amazingly lucky," a paramedic says. "You really damaged that car and you seem pretty good." At the hospital emergency room, the kind and capable hospital staff takes care of me. More questions, more probing, blood pressure measurements, and more amazement. They clean the wounds on my left knee and put ice packs on my right leg and left shoulder. The nurses keep calling each other to my side to look at the book I was carrying and remarking on the title. It is Crossing to Safety by Wallace Stegner (Stegner 1991). The coincidence never occurred to me before they mentioned it. After three hours in the emergency room, x-rays, and various tests, they only find that I have a badly separated left shoulder, banged-up legs, and a nice selection of bruises, aches, and pains. I have no broken bones and not even scrapes from where I hit the pavement. They put my arm in a sling and discharge me. In my shaken state, I take a taxi back to my motel. They gave me a prescription for powerful painkillers. Although I am in a good bit of pain, it seems manageable. Despite the doctor�s warning that I won�t be able to sleep without the painkillers, I decide to skip them tonight and just take aspirin. I think it is more important for me to face the significance of what happened with a clear head. Back in my motel room, I continue icing my various bruises and reading Crossing to Safety. I am looking for some clues to the meaning of it all. Because of the difference in time zones, I only slept a few hours the night before, but I am so full of pain, adrenaline, and joy that I cannot consider sleeping now. Instead, I try a method I have developed over the years for dealing with nightmares and dreams with troubling imagery. I get out of bed, sit in a meditation posture, close my eyes, and hold the troubling images as vividly as possible in my mind. I set aside any intellectual formulations and interpretations and just concentrate on the images. I become one with them; soak myself in them, no matter how horrendous they are. In this way, these feeling-laden messages from the unconscious are granted autonomy, allowed to speak. This attention eventually drains the fear and loathing from them and I can get back to sleep. It allows the images to do their work, to perform the unconscious compensations even when I don�t understand them analytically. Several times, I relive my accident with this technique. I let the thud, blackness, pain, and terror wash over me in all their ferocity. I directly confront my horror at what easily could have been. Still, the adrenaline pours through me. It is difficult getting comfortable in bed, but I eventually get to sleep around 3:30 A.M. I awake a few hours later and feel like the voltage in my nervous system is set too high. Despite the pain and exhaustion, I am in a state of extreme joy and gratitude. I have been to the edge of the abyss. In my thanksgiving, I rededicate myself to realizing the nature of soul in all its complexity. While in the emergency room, I try to reconstruct what happened in the accident. I never did see the car, nor did the driver see me. When I ran in front of the car, its right headlight hit the outside of my left knee. There must have been little or no weight on that leg, otherwise my knee would have shattered. Instead, judging from the huge bruise on the inside of my right calf, my left foot slammed into my right calf and knocked me off my feet. Then, as the marks and blood on the car hood showed, I flipped up on the hood with my feet toward the driver�s side. The windshield then slammed into my left shoulder throwing me up and outward and the car drove underneath me as it screeched to a halt. I cannot remember either how I went through the air or landed. The impact must have knocked me unconscious, and I flew through the air like a rag doll and hit the ground in that limp state. That prevented me from trying to catch myself and reduced my injuries from the fall. Around 6:00 AM the next morning, I return to the accident site. I go there as part of my exercise of directly facing the terror of the accident. I also realize that three simple measurements, a few reasonable assumptions, and some easy calculations can yield an estimate of how fast the car was going. I need to measure the maximum and minimum distances between the site of impact and where the headlight glass landed and get the height of the headlight. The glass is still there. I pace off the distance�I learned many years ago how to pace off strides that are very close to three feet each. The first fragments are thirteen paces from the impact site in the crosswalk and the farthest ones are eighteen paces, making the glass from thirty-nine to fifty-four feet from the site of impact. I revisit the site at noon on the next day and remeasure the position of the glass fragments. I want to see if the traffic moved the fragments. I can measure no noticeable change in the position of the glass. I even return a little over a week later, just before flying home, pace off the distance of the fragments and again find no noticeable change. Even before I do the calculations, I know the car must have been going fast to throw glass more than fifty feet. My calculations show that the car must have been travelling thirty-five miles per hour, with an uncertainty of about ten miles per hour in either direction. These estimates seem high, but the driver was passing the stopped cars on a highway with a speed limit of forty-five miles per hour. It wasn�t even his sports car; he was test-driving it. It is likely that he had been enjoying the car�s acceleration and handling. Given what could have happened in my accident, I am extremely fortunate. Appreciating, even roughly, how fast the car was going only deepens my gratitude. As the terror and adrenaline surge subside, the gratefulness and devotional feelings grow. I only want to live each moment as though it is my last and devote myself to finding out who I truly am. I used to get so passionate about all sorts of inconsequential things. Now all this ballast of normal consciousness is thrown overboard as I sail on sacred seas. From now on, I have no time for trivial concerns or activities. Despite the reality and sincerity of my new realizations and planned reforms, I am a boring saint, full of pious platitudes and worn nostrums. There is a tincture of sadness in me because I know my sainthood will not last. The old Vic will surely return and send all my bliss and pious philosophizing out the window, but for now, all is light and gratitude. I want to make the most of it. My wife and I had planned to tour around the Southwest on our way to Santa Fe, where I was to give another talk. However, I need to recuperate, so we find an extraordinary hacienda in the desert just outside Tucson and stay for several days of unmitigated bliss. Every detail of the desert is radiant, fresh, and clear. The lodge owner loans me a little CD player and I listen to the music intended for my cancelled workshop in Phoenix. Each note of the second movement of Samuel Barber�s violin concerto is a blessing. I write email to friends back home telling them what happened and expressing the depth of affection for them that normally goes unsaid. The flood of loving and supportive email that comes back surprises me and moves me to tears. Looking back, it is clear that the week following my accident was the most beautiful spiritual experience of my life. I certainly would not have chosen that way to get such an experience, but it was still priceless. There are some obvious and important lessons from the accident. I have been blessed with a lot of energy, and often squeeze in too many experiences and rush like a madman to execute them all. I can abuse my blessing. While this is a critical lesson, I am convinced that there is more to it, especially because of the title of the book I was carrying: Crossing to Safety. It is taken from the poem, "I Could Give All to Time," by Robert Frost. I give a detailed interpretation of this poem in Head and Heart (Mansfield, 2002, pp. 144-6). Here I only mention that the poem says that the only genuine "crossing to safety" is making contact with the immortal aspect of soul�the exact idea saturating my mind just before the accident. The classical philosopher Plotinus holds that soul has a complementary nature. Soul is simultaneously divisible and finite, and thus subject to the destruction of time, yet also undivided, infinite, and immortal. Lacking divisibility the higher octave of soul cannot be separated between past and present or inner and outer. [Plotinus, Ennead, 4.1-2] In each experience, at every level, no matter how mundane or exalted, we are both divisible, finite creatures subject to decay, and simultaneously indivisible, immortal, transcendent beings that surmount the division between matter and psyche. Any intimation of the immortal aspect of soul is a profound spiritual experience and, according to Frost, therein lies our true "crossing to safety." In my accident, I crossed to safety physically and was profoundly grateful for it. However, I also crossed briefly to the side of the invisible and immortal soul and that safety is of a deeper order, as Frost intimates. I am not saying that had I suffered more physical harm, I would have been equally grateful and filled with devotion. I could not hold on for long to that light from beyond my ego, although I will always cherish it. The experience taught me the great value of appreciating the world simultaneously from the viewpoints of both Newton and Jung�from the head and the heart. Through the stark conclusions of physics, I appreciated the transforming grace more fully, while the grace helped me appreciate the lawfulness of the Newtonian cosmos and showed me its limitations. For years I have been struck by both the trauma and the extraordinary numinosity of the experience. Despite the overpowering sense of meaning and purpose in the event and the accompanying state of bliss, I always had difficulty articulating its meaning until it hit my like a thunderclap. On one hand, I was acutely aware of divisible soul, as the historical individual who fears annihilation and whose body experienced so much pain. On the other hand, the synchronicity experience and the accompanying bliss revealed the indivisible aspect of soul, that principle which cannot be divided between the outer and inner world, between matter and psyche. Crossing to safety in Phoenix provided the image, the living experience, of both aspects of soul in the same event. A formerly fascinating piece of philosophy was incarnated in living experience. In short, the trauma simultaneously revealed both complementary aspects of soul, wrapped me in a mantle of ecstasy while grounding me in body, and pointed me in new directions for psychological development and scholarly effort. Although much more can be said about the significance of the event for my individuation, my interests in this paper are directed toward the complementarity between analytical psychology and physics. In response to the accident, I sought two entirely different kinds of explanation: scientific and synchronistic. In the scientific explanation, the emphasis in this Newtonian example is on causality, where one well-defined thing affects another through the exchange of forces, energy, or information. For example, the right headlight hits the outside of my left knee, which has little weight on it; my left foot slams into the left side of my right calf; and I am flipped up on the hood without having my knees shattered. This is a completely impersonal and universal process, governed by Newtonian physics. Although the timing had to be just right, nothing about the event was special or unique to me. You could replace me with a crash dummy and study the phenomena with a high-speed camera. Since the phenomena are all entirely objective in this explanation, not dependent upon our likes or dislikes or any other personal components, we could repeat the experiment with the crash dummy as many times as necessary and expect repeatable outcomes. Any meaning emerging from such explanation is restricted entirely to the impersonal, material, factual level of the event. In other words, it is devoid of higher meaning or purpose. The emphasis is entirely on the literal significance of events. According to conventional physics, the matter in the accident, from the car to the molecules in my own body, is dead. It lacks interiority, consciousness or will and is merely passive to the forces acting on it. In contrast, synchronistic explanations are acausal, not governed by forces and physical energy exchange. The outer event of surviving a serious traffic accident is not causally related to the inner event of my thinking about the complementary nature of soul and carrying Crossing to Safety. Instead, both the outer and inner events are symbolic expressions of transformative meaning, a significant episode in my individuation, my soul-making, of coming to be who I am truly meant to be. Therefore, these events are unique to me and my development. If it had been somebody else in front of that sports car, the accident would have had a different significance, one unique to that person and their development. Of course, such experiences are unrepeatable. Yes, I could run in front of a speeding car more than once, but each time it would be a different experience, since I am transformed and therefore different after each event. Although synchronicity experiences are also unpredictable, they usually occur in periods of increased stress or spiritual crises. Rather than being objective in the scientific sense, these experiences are deeply subjective intuitions of meaning. Finally, in synchronicity, the matter in the event is the vessel or vehicle for the expression of the archetypes, which also incarnate in the correlating psychological states. This ability for matter to incarnate intelligence and purpose is in stark contrast to its deadness in physics. Table 1 summarizes the differences between these modes of explanation and gives some meaning to Pauli�s assertion that analytical psychology and physics are complementary. We can more fully appreciate the complementarity between these two types of explanations with the help of an image. Consider the world of physics to be a two-dimensional horizontal plane. This plane can be defined using two perpendicular axes as shown below in Figure 2. One axis represents the theories or mathematically formulated laws of nature, the impersonal and universal structures that we believe underlie all phenomena. Here for example, we find the mathematical expression of quantum mechanics or general relativity, or in the example above, Newtonian physics. Notice that for an entity or principle to be mathematically formulated, it must be precise and fully objective. Here we are followers of Descartes who advised us to build our theories only from clear and simple ideas, from precisely defined, objective elements. Mathematical formulation clarifies our conceptions and often allows us to deduce unexpected consequences of the theory. As we move farther along the mathematical axis, the theories become more abstract and comprehensive. Near the intersection of the two axes is Newtonian mechanics, while far from the intersection we find the various highly abstract schemes for unifying all the forces in nature. For ease of reference, call this the mathematics axis. The other perpendicular axis defining the plane of physics represents the experimental or laboratory study of physical phenomena, the empirical axis. Here for example, we find the various laboratory studies which, in combination with theory, establish such basic features of nature as its acausality and nonlocality. As we move farther from the axes� intersection along this axis, the experiments become more technical and removed from everyday experience. For example, near the axes� intersection we have Galileo�s experiment with falling bodies or introductory student laboratory exercises. Farther out along this experimental axis we find high energy particle collisions within giant particle accelerators and astronomical probings of the earliest features of the cosmological big bang. In general, all progress in physics is a continuous interchange between the mathematical descriptions and the empirical measurements that probe the adequacy of these theories. Consider every event in physics, whether the formulation of a new theory or the performing of an experiment or some combination of theory and experiment, to occupy a point in the plane. If the event or piece of physics is more theoretical, its location in the plane will be closer to the mathematical axis, while if it is a more purely experimental effort then its position is closer to the experimental axis. (The psychological example discussed above is not appropriate for placement in the plane because it was unique and unrepeatable and thus falls outside of normal science.) In general, experimental events in physics are controlled, fully objective, understood within a particular theoretical structure, and have no essential reference to consciousness. Yes, consciousness interprets experimental events within a given theory, but as the computer controlled experiments that manipulate equipment and take data without human intervention clearly show, experimental events do not require an individual�s consciousness. Next, consider the world of analytical psychology to be a two-dimensional vertical plane, defined by two perpendicular axes as in Figure 3. The vertical axis represents the theoretical structure of the psyche, its differentiation into conscious and unconscious aspects, archetypes, etc. Along this axis, we speak about unconscious compensation, individuation, meaning, the archetype of the self, and the general theoretical underpinning used to describe and explain our experience. For ease of reference, call this the meaning axis. Near the intersection of the two axes, we find the personal unconscious while farther out along the meaning axis we find the psychoid archetypes, which underlie both psyche and matter. Of course, meaning is associated with expressions of the archetype of the self, which are often infused with numinous feeling. These concepts and their corresponding structures along the meaning axis do not have the precision and objectification found in mathematical laws of physics. Meanings, by their intimate association with the archetypes, interpenetrations with other meanings, and their connection to feeling and subjectivity, cannot be objectified and made precise as we can ideas in physics. Nevertheless, meanings can be articulated clearly enough for us to argue passionately about them. The horizontal axis represents psychological experience, including individuation, our experiences in both the inner and outer world that serve as the empirical data for our psychological and spiritual development. Near the intersection of the axes, we find primitive eruptions of the shadow and farther out along the axis are big dreams or Jung�s visions after his heart attack. For ease of reference, call this the empirical axis. Just as in the physics plane, every psychological experience has a location in the plane of analytical psychology. In my example above, the accident and my initial emotional response to it lie along this empirical axis, while my later attempt to understand the synchronicity lie closer to the vertical meaning axis. In contrast to the scientific plane, the involvement of our subjectivity is crucial for turning events into experience. In other words, the involvement of soul in events generates experience. My image is completed by putting these two planes together as in figure 4. Now we have a three-dimensional space defined by the horizontal plane of physics and the vertical plane of analytical psychology. 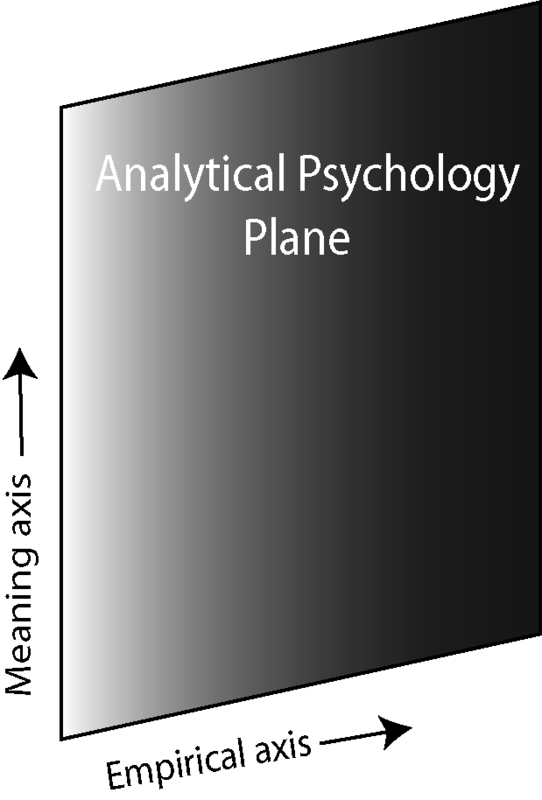 The planes intersect along the experimental axis for physics and the empirical axis of analytical psychology. Assume that all of reality is spanned or covered by this diagram. Thus, any experience or scientific event must have its position in this three-dimensional space. The points which are entirely in the physics plane are strictly scientific events while those points that are some distance above the physics plane, are experiences because of the involvement of subjectivity. In the three-dimensional space near the intersection of these two planes, we find the many correspondences between analytical psychology and physics�such as the various expressions of acausality and nonlocality in both physics and in synchronicity. Figure 4 shows that there are dimensions of reality not accessible to a purely scientific view, just as there are dimensions of reality not accessible to a purely analytical psychological view. For example, although physics can analyze the physical details of the accident discussed above, it has no access to the synchronistic meaning. Similarly, analytical psychology can address how the accident transformed me as an individual, but it can say nothing about the motion of irregularly shaped glass fragments flying through turbulent air. Some worldviews attempt to collapse the three-dimensional space into two-dimensions. For example, the philosophic view of physicalism or radical materialism holds that all mental states are ultimately reducible to brain states. Alternatively, that all of nature in both the inner and outer world is ultimately reducible to material process governed by the laws of physics. This view collapses the plane of analytical psychology onto the plane of physics. In contrast, idealism claims that all science is merely a complex expression of archetypal process in the psyche. Alternatively, that all of nature is ultimately a complex set of mental images, including our notion of independent matter. This view then attempts to absorb the plane of physics into an expanded definition of the plane of archetypal psychology. (Of course, either materialism or idealism violates the complementarity of analytical psychology and physics.) If we follow Jung and avoid either of these extreme positions we see that, although there are clear intersections of physics and analytical psychology, there are also many differences and divergences. I drew the plane of analytical psychology vertical and the plane of physics horizontal for important reasons. First, consider the verticality of the plane of analytical psychology. In analytical psychology, the symbolic method is the primary means of appreciating principles such as the unconscious that transcend the empirical ego and yet still express themselves in the psyche and the external world. Unconscious contents do not exist in space and time and unlike objects in the world, they interpenetrate, have a mysterious timeless quality about them, are inexhaustible, and so forth. In other words, levels of being or ontology are intrinsic to analytical psychology and for this reason, its plane is drawn vertically. We recognize this verticality in our language by often using the term depth psychology interchangeably for analytical psychology, despite the inadequacy of such spatial language. In contrast, consider the horizontal nature of the plane of physics. Although the mathematical laws and the associated experiments can be exceedingly abstract and imply counterintuitive ideas and paradoxes, they are nonetheless precisely and objectively defined and fully accessible to consciousness. Consider a simple example. The Schr�dinger Equation governs all of non-relativistic quantum mechanics. Although it implies counterintuitive ideas such as acausality, the Heisenberg Uncertainty Principle, and nonlocality, we know that each of these ideas is perfectly well defined logically and mathematically. For example, we can quantitatively and unambiguously specify the degree of nonlocality or uncertainty in a quantum system. The mystery is objective, quantifiable, and usually penetrable by fuller understanding or conscious articulation. Although there are still mysteries in nonlocality, today we have advanced to understanding how nonlocality can be used in quantum teleportation experiments (Hall 1997). This is in sharp contrast to an archetype, which we can only adumbrate and never fully penetrate nor exhaust with our study. In summary, despite the varying levels of abstractness, all scientific objects, theory, and experiments exist on the same plane of being. For this reason, I have drawn the plane of physics horizontally. In my example above, the most striking thing about the inner experience was its reference to the vertical, its subjective, symbolic, and yet direct experience, of the indivisible or timeless aspect of soul, that which transcends the tiger of time and offers true safety. Although I knew it could not last, I was in an altered state of consciousness for a full week. In contrast, my scientific analysis of the accident was fully objective, impersonal, factual, and completely available to anybody using normal empirical consciousness�all on the same level of being. Even the uncertainty in my calculation was mathematically quantifiable. To sharpen our distinction, consider the views of evolution from both science and analytical psychology. In the scientific view, Darwinian evolution is at the most fundamental level governed by random mutations in our genes, an expression of quantum mechanical fluctuations intrinsic to any quantum system, but intensified by outside influences ranging from cosmic rays to heat. Some mutations generate better adaptations to the environment, others worse, while some result in evolutionary cul-de-sacs. This inefficient trial and error experimentation is full of suffering and extinctions, both large and small, and has no purpose or endpoint. There is no teleology or morality in quantum fluctuations. Much as it may disturb many nonscientists, the question of meaning or purpose simply does not enter into any scientific explanations. Purpose, meaning, or teleology has been completely removed from science for more than two centuries. As Pauli said, "Although microphysics allows for an acausal form of observation, it actually has no use for the concept of �meaning.�" (Meier, 2002, p.56) Alternatively, a more modern Noble Prize winner, Steven Weinberg, says, "There is no purpose revealed in the laws of nature." (Weinberg 2001, p. 260). In contrast, analytical psychology pivots around meaning and the process of individuation that incarnates it. Rather than quantum fluctuations and environmental adaptations, analytical psychology seeks to understand experience as the ego�s adaptation to the demands of the self. In short, evolution in science occurs without meaning and teleology while they are the heart of analytical psychology. 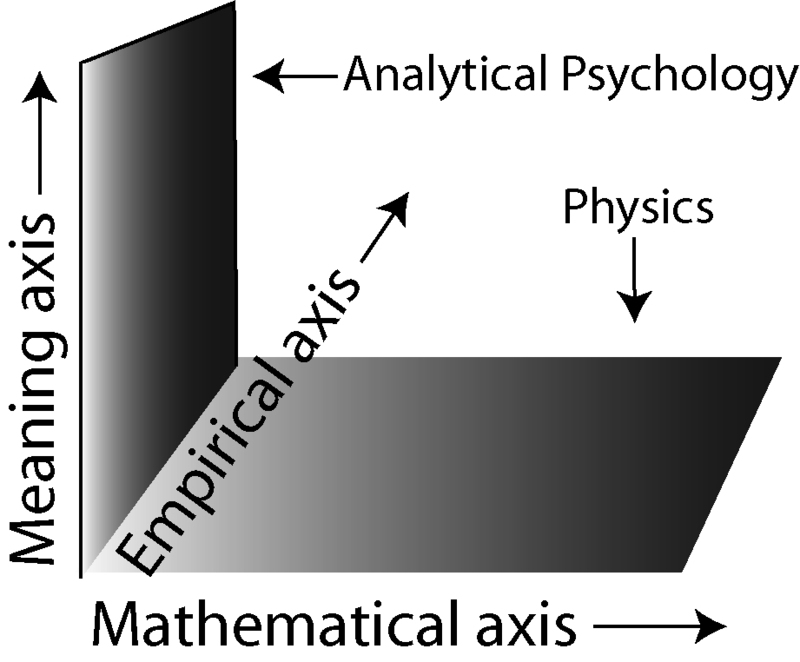 There are many connections between analytical psychology and modern physics, especially in the region where they intersect along their empirical axes, as shown in figure 4. In addition, ideas from the realm of matter such as acausality and nonlocality from physics often find a powerful resonance with parallel ideas in the psyche. Not only do they make the mysteries of the psyche more understandable, they often guide us to new and deeper appreciations of both psychology and physics. However, in the conventional scientific view, the world is just matter and energy entirely lacking in any interiority, consciousness, or will. Objective, impersonal, and precisely quantified mathematical laws govern this matter. Meaning or purpose has no place in this view. Despite the vastness of physics and the possibilities for abstract formulation of its laws, physics always operates on the plane of empirical consciousness. Any interiority, consciousness, or will is relegated to the complex life forms, especially humans. In contrast, analytical psychology asserts that along with the psyche, the material world can also embody autonomous intelligence and purpose, can be a vehicle for the expression of transformative meaning. Whether in a synchronicity experience or in the development of the symbolic life, the material world is a fit vessel for the display of the gods, for exhibiting archetypes and their numinous meanings. By its very nature, analytical psychology connects the individual to higher levels of meaning and subjectivity, to principles that transcend the ego and its level of empirical consciousness. This view necessarily implies different levels of being, which I have emphasized by the verticality of the plane of analytical psychology, which contrasts with the horizontal nature of physics. Appreciating these striking differences between analytical psychology and physics gives a little sense of what Pauli meant when he wrote, "I regard physics and psychology as complementary types of examination." I will illustrate this more fully with reference to the three aspects of complementarity in physics outlined above in section II. First, echoing the mutually exclusive experimental arrangements needed for the study of each member of a complementary pair, the consciousness and conditions required for a subjective intuition of meaning embodied in both the inner and outer worlds differ markedly from those required for a scientific explanation of the same event. I cannot intuit soul as both indivisible and divisible and be grateful for its expression in a synchronicity experience while simultaneously calculating how fast the car was going when it hit me. The very disparity of these two views of the event is an expression of the complementarity between analytical psychology and physics. Second, just as each member of a complementary pair is equally real and equally important in characterizing a quantum system, we cannot reduce the accident to just a synchronicity experience and ignore both the traffic laws and the laws of physics. Analogous to our inability to reduce one member of a complementary pair to the other, we cannot consider the accident as just an expression of the complementary nature of soul, which cannot explain my flight through the air. That requires Newtonian physics. Third, the unity that resolves the complementarity between analytical psychology and physics is not at the same epistemic level as either member of the complementary pair. In my example, the unifying image was filled with pain, gratitude, and joy, which expressed both the divisible and indivisible aspects of soul. For analytical psychology and physics, their very complementarity implies that neither today�s physics nor psychology alone can provide a unifying vision for all of reality. In terms of my last diagram, figure 4, we cannot span the three-dimensional space of reality just using the two dimensions of either physics or psychology. The unifying reality must transcend them both and yet integrally include each of them�a topic developed in forthcoming work. Jung was a controversial pioneer and because of it suffered much unjust criticism. He often tried to make his ideas seem less strange and more acceptable by drawing legitimate support from modern physics. Despite this legitimacy, there is danger because in our culture the sirens of science and its worldview sing an alluring song. If they captivate us then we violate the complementarity between analytical psychology and science and crash on the rocks of scientism. Then the appreciation of uniqueness and equality of partners so necessary for any fruitful relationship drowns in dominance. We then lose understanding of both disciplines and are therefore compromised in our efforts to understand their relationship. Then rather than crossing to safety, scientism breaks our connection to meaning and the unity it expresses�the most precious jewel within analytical psychology. Bohr, N. (1934). Atomic Theory and the Description of Nature. Cambridge, UK, Cambridge University Press. Bohr, N. (1958). Atomic Physics and Human Knowledge. New York, NY, John Wiley & Sons. Hall, Alan (1997). �Beam Me Up�, Scientific American, December 29. Jung, C.G. (1978). �Synchronicity: An Acausal Connecting Principle." CW 8: 419-531. Princeton, NJ: Princeton University Press. Mansfield, V. (2002). Head and Heart: A Personal Exploration of Science and the Sacred. Chicago, IL: Quest Books. Mansfield, V., Rhine-Feather, Sally, and Hall, James (1998). �The Rhine-Jung Letters: Distinguishing Parapsychological from Synchronistic Events.� Journal of Parapsychology, 62:1. Meier, C.A., editor (2001). Atom and Archetype. Princeton, NJ, Princeton University Press. Stegner Wallace (1991). Crossing to Safety. New York: Penguin. von Franz, Marie-Louise (1992). Psyche and Matter. Boston, MA: Shambhala. Weinberg, Steven (2001). �Can Science Explain Everything? Anything?� New York Review of Books, Volume 48, Number 9. Reprinted in The Best American Science Writing 2002. edit. Ridley, M. New York, NY, HarperCollins Publishers. Return to VM's home page.